LucasArts announced that Traveler's Tales games is making a third Lego Star Wars game based on the Clone Wars animated series. The same team at TT Games that made the first Star Wars Lego games is busy crafting LEGO® Star Wars III: The Clone Wars, complete with all of the necessary trademarks. The game will feature all the characters from the two seasons of the animated series, plus some old favorites. 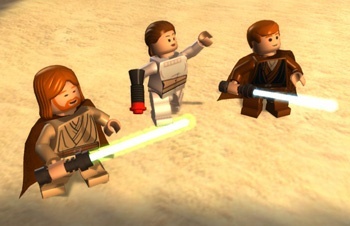 You can choose to play as a Jedi or a Separatist and Lego Star Wars III offers new gameplay features including head-to-head combat and Lightsaber attacks. LucasArts stated that it will be released on all platforms and handhelds (Wii, PS3, 360, DS, PSP, PC) sometime in Autumn 2010. Keeping the series alive was a no-brainer for LucasArts, despite the lack of more movies on which to base the game. "The LEGO® Star Wars franchise is a massive hit with fans, bringing in sales of over 20 million units worldwide," said Darrell Rodriguez, president of LucasArts. Rodriguez expects the new installment will be "delivering the humor and fun players expect from this award-winning franchise." I enjoy the Lego games for the most part. They are worth a few laughs at the expense of the source material, but I just can't spend tons of time playing them. It's my compulsive videogame completeness syndrome. I know that there are so many damn secrets doors and pips that I'm missing and I can't force myself to ignore them. So I get frustrated going up and down each level, until my brain explodes and I have to turn it off. Anybody else know what I'm talking about?